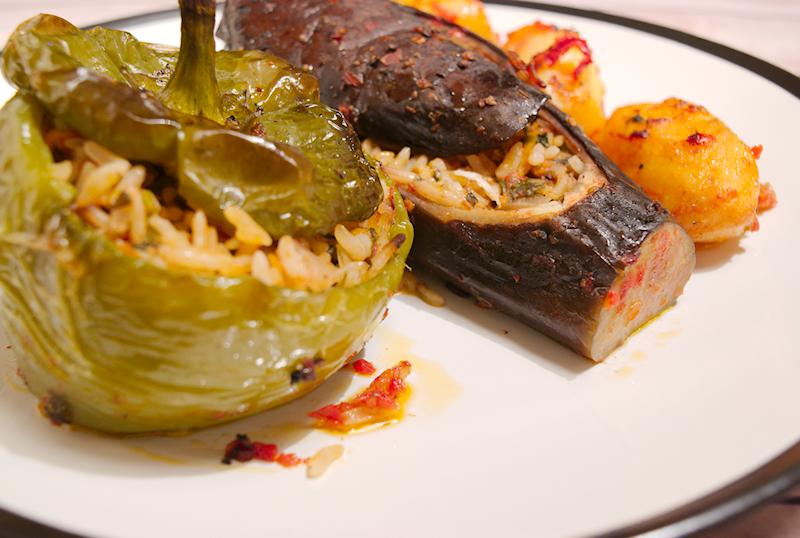 A summer favorite casserole (Gemista) with stuffed eggplants and peppers with rice and herbs. 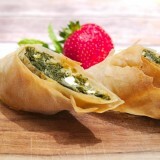 A healthy vegan dish to indulge without second thoughts. 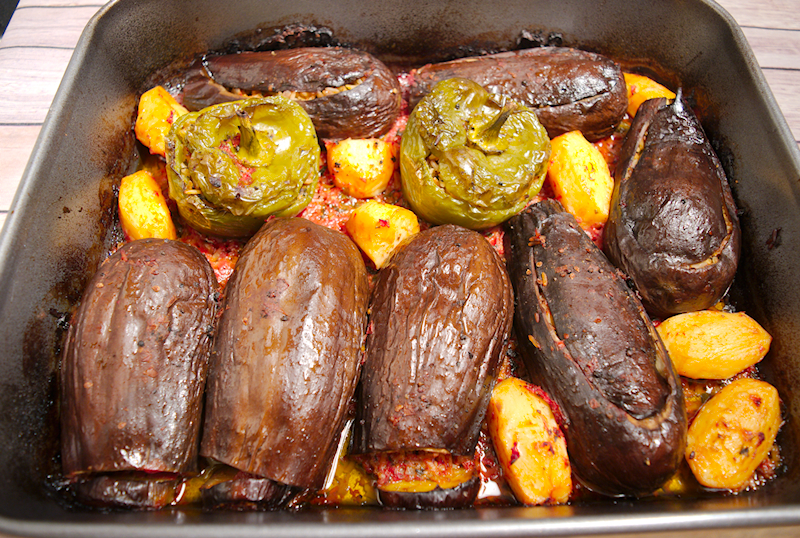 Stuffed vegetables is one of my favorite dishes, easily. There are many versions of them. 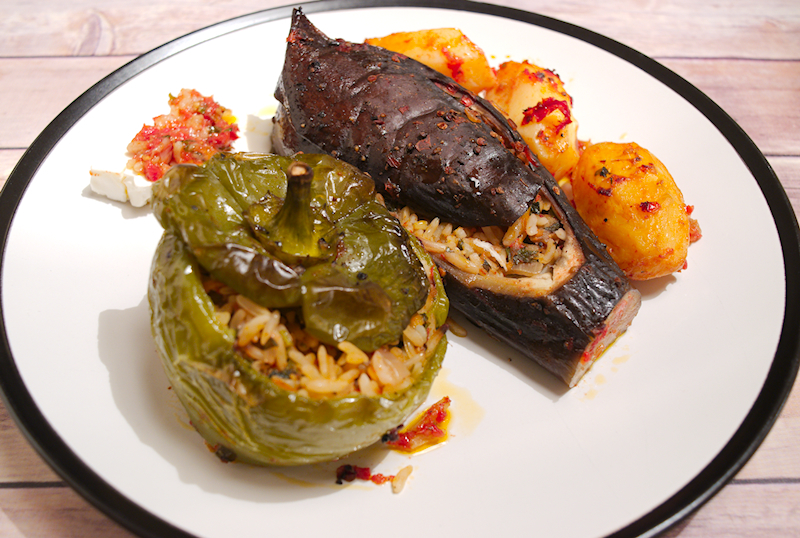 You can have stuffed eggplants with meat (with or without rice), stuffed peppers with cheese etc. But in this case, simplicity makes perfection. “Gemista”, as they are called in Greece, is a traditional summer casserole made with the vegetables that grow in the field near you. Tomatoes, zucchini, peppers and eggplants. 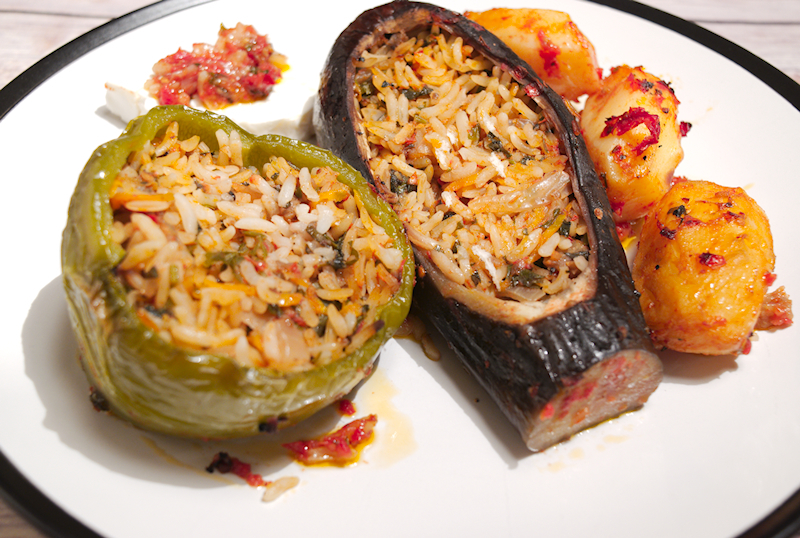 You prepare a mix with rice and herbs, you stuff them, add lots of olive oil and tomato and cook it in the oven. Voila! You are in heaven already when your kitchen starts smelling these wonderful aromas coming from the oven. It’s literally a vegan dish as you don’t need any animal products. Only what’s coming from Mother Earth. In fact, you are not missing anything. 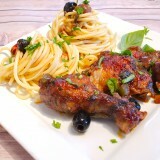 Gemista is a hearty meal that will content your palate and tummy. As I often complain, I can’t find any big ripe tomatoes where I live. And I miss that a lot. So, I opted for a version with eggplants and peppers only. I found some smaller sweet tomatoes to make the sauce but it would be ridiculous to stuff them. I also used long grain rice as I believe it’s the best for making Gemista. You already have all the herbs to bring the aromas so you don’t need basmati or any other kind of aromatic rice. 1 ½ yellow onion finely chopped. 1 ½ cup of long grain rice. 5-6 medium sweet and juicy tomatoes. 300 ml (10 fl oz) tomato passata or tinned tomatoes. 1 cup of extra virgin olive oil. A small bunch of fresh mint finely chopped. A generous bunch of flat leaf parsley finely chopped. 3-4 potatoes cut in big chunks. Wash the eggplants and peppers. 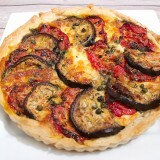 Take one eggplant and cut a thin piece from the top lengthwise, making sure you don't reach the edges (bottom and top). Use a knife or/and a spoon and remove the flash from the eggplant making sure you don't break the walls. 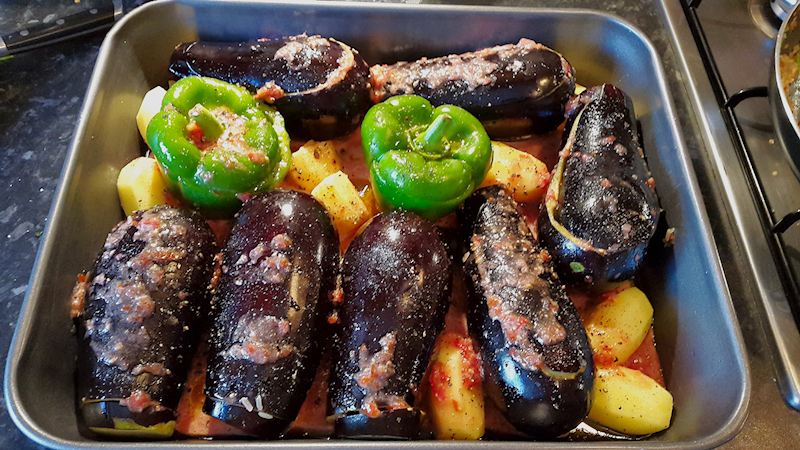 Keep a handful from the eggplant flesh for the mixture. Alternatively, you can cut a piece from the top and empty the flesh until you reach the bottom. For the peppers, make a circular cut with a knife close to the top and remove it. Cut all the seeds and keep the top as you are going to use it as a lid. 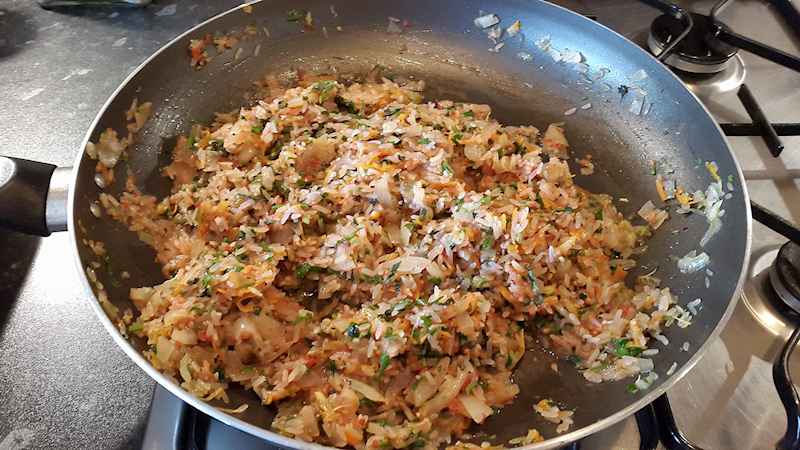 Add the half of the fresh tomatoes and the garlic in a food processor and create a nice paste. Chop finely the handful of eggplant flesh you kept. Add half of the olive oil in a frying pan on medium heat. Add the onion and cook until it starts getting soft. Add the eggplant flesh and carrot and cook for another 1-2 minutes. Add the rice, stir well and cook for another minute. Add the tomato paste from the processor, ⅓ of the passata, parsley, mint and season generously with salt and pepper. Stir well, bring it to boil and remove from the heat. Add the remaining tomatoes in a the food processor and make another paste. 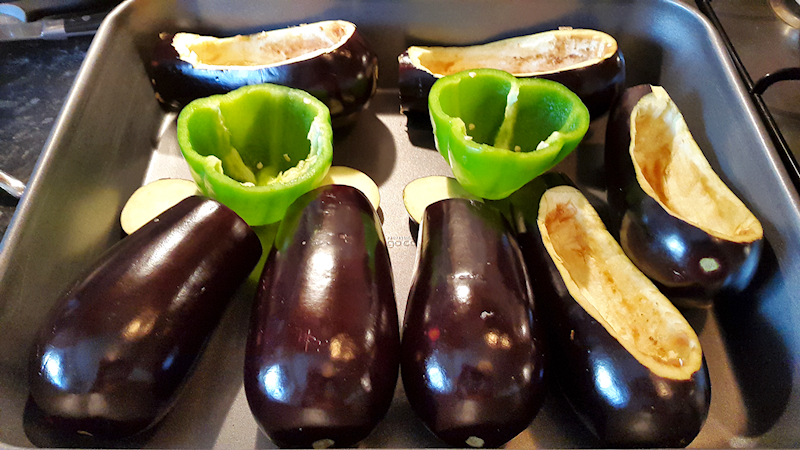 Use a spoon and start filling the eggplants the peppers. Do not fill them until the top as the rice will expand during cooking. 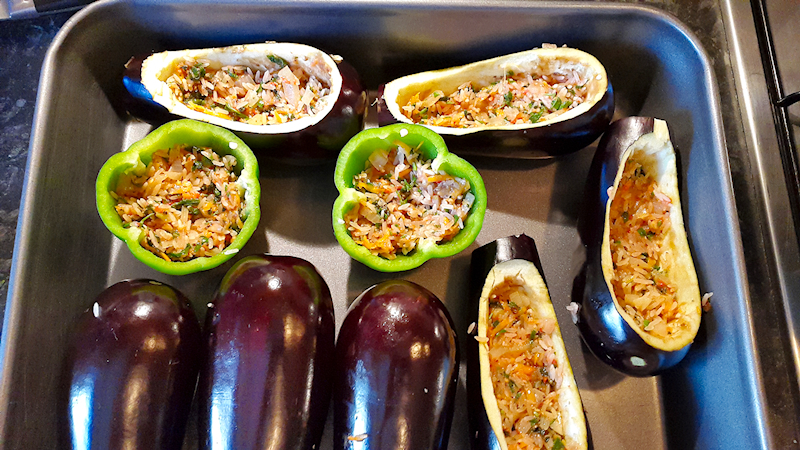 Place the stuffed vegetables in a deep baking tray and cover them with their lids. Add the potatoes in the tray and pour in the olive oil, fresh tomato paste and passata. If you think there isn't enough oil, add some more. It must be an oily dish. Add a cup of hot water. Season with salt and pepper. Cover the tray with kitchen foil and let it cook in the oven for ~ 90 minutes. Check from time to time to see if it needs some more liquids (water). Uncover the tray and cook for another 15 minutes to get a nice brown color. Serve the stuffed vegetables warm with a piece of Feta cheese on the side.